Description: Easy creation & upload of AminetReadmes. 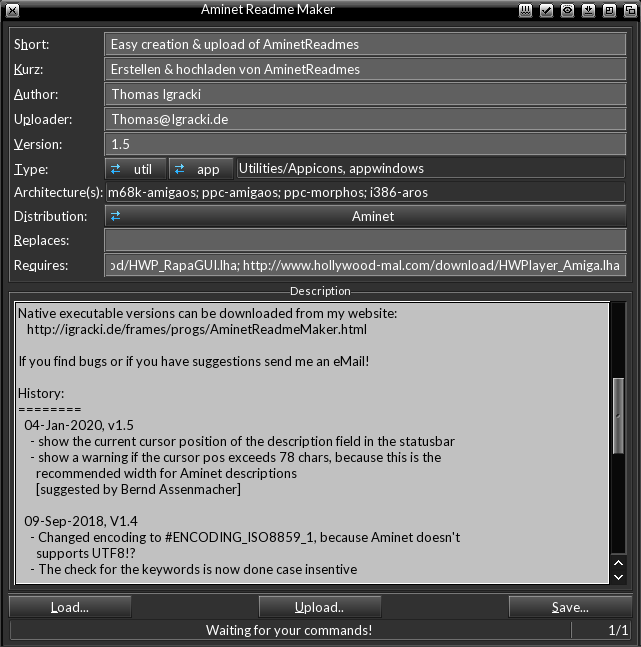 This little tool allows you to easily write a Aminet Readme file and also upload it to the aminet server! plugin: Windows, Linux (GTK), AmigaOS3, AmigaOS4, MorphOS and AROS! You need the Hollywood Player (http://www.hollywood-mal.com/download/HWPlayer_Amiga.lha) to run it! and I will send you a compiled version for your favourite OS! - added support to load a readme at startup with "-f", "-r" or "-readme"